R.S.V.P. stands for a French phrase, "répondez, s'il vous plaît," which means "please reply." The person sending the invitation wo­uld like you to tell him or her whether you accept or decline the invitation. That is, will you be coming to the event or not? Etiquette rules followed in most Western cultures require that if you receive a formal, written invitation, you should reply promptly, perhaps that same day. For hosts who are planning a dinner party, a wedding or a reception, this is important from a practical point of view, because they need to know how many people to count on and how much food and drink to buy. More important, though, is the simple courtesy of responding to someone who was nice enough to invite you, even if it is to say that you regret that you will not be able to attend. To generalise your reply envelope needs to be small enough to fit inside your invitation envelope. Invitation envelopes are all down to the couples own personal choice, but generally the envelope needs to make a statement about the message it contains, this can be an envelope that has a real feel of quality, and presents the invitation in the best manor possible. Some couples want to make a bold and bright statement, others have a theme or colour running through their planned event and want their wedding stationery to match, others are just looking for traditional good quality white or ivory envelopes. 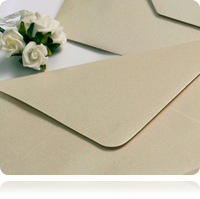 Hammer or Linen Effect envelopes are always popular as the added embossed texture creates a real feel of quality. Over the last few years it has become increasingly popular to send out a Save the Date Card, this card is sent well in advance of the forth coming wedding event, this card usually contains a photograph of the happy couple, the names of the couple and of course the date and location for the happy day, allowing friends and family to plan for the event and their personal invitation will follow. The save the date card should be a personal and well presented card that family and guests will want to display in their home. An Order of Service wedding card is an essential must-have for the big day. They allow your guests to see how your ceremony will unfold and what parts they will play. Family and and close friends will want to keep hold of theirs as a memento of the service. The Order of Service can be in any format you like, but usually contains upto four printed pages of text, these can be fully personalised with your wedding details, hymns, music, prayers, readings and blessings can all be added. We would always recommend talking with the person carrying out the service/ceremony for the best advice and how they would like the information to be presented. It is also advised that any order of service has the approval of the person conducting the ceremony before going to print. 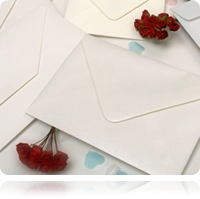 What size are wedding invitation envelopes? The size of the envelopes you need all depends on the size of your wedding invitations. 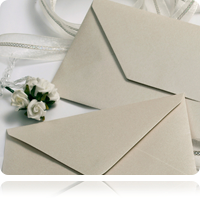 Wedding invitations come in an array of sizes from small square to larger A5 sizes. The most popular size is 5" x 7" which would require a 133 x 184 mm envelope. Another popular size is A5 invitations which require a C5 envelope. 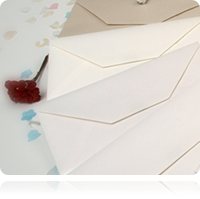 Many people tend to create and design their own invitations, in which case it is best to design the invitation for standard envelope sizes or you may struggle to find an envelope to fit.